Eavesdrop on Experts, a podcast about stories of inspiration and insights. It's where expert types obsess, confess and profess. You'll meet people you wouldn't normally meet but will be glad you did. I'm Chris Hatzis. Let's eavesdrop on experts and see how these 21st century explorers are changing the world, one lecture, one experiment, one interview at a time. I’m walking around the zoo and it’s wonderful. I haven’t been here in ages. But I can’t help but think of my relatives. I mean my really, really distant relatives. Yeah, those guys. Perhaps the best person to visit a zoo with, is someone like Professor Bernard Wood, who studies the origins and evolution of homo-sapiens – us. It turns out that the creatures that are most closely related to us are Chimpanzees and Bonobos. We are more closely related to those two creatures, than to any other great ape. Now that’s probably extremely puzzling for chimps and bonobos because they are in zoos along with gorillas and orangutans and apparently, they are more closely related to the people that wander around zoos. Today, we’re eavesdropping on Professor Bernard Wood from the George Washington University, who is also a Miegunyah visiting fellow at the University of Melbourne. He’s meeting up with reporter Dr Andi Horvath. Now we branched off from chimps and bonobos, but there’s quite a bit of genetic connection between us and the chimps. That’s Dr Andi. She’s pondering the fact that humans and chimpanzees share ninety-six percent of their DNA, but what about the other four percent? In other words, if they’re so smart – why aren’t they doing stuff like driving a tram. The difference between us and chimps is in the order of one or two percent. Clearly that’s an important one or two percent because it means that you and I are sitting in a tram and I don’t see any chimps and bonobos running tram lines. That’s professor Bernard Wood. But we do need to keep you in a little bit of suspense, so we’ll hear his answer later. But in the meantime stick with me – just say you’re family if anybody asks. Let’s follow Dr Andi and Bernard to somewhere quiet. Hello Professor Bernard Wood. I love it that we separated from chimps and bonobos a long time ago, but that there were other branches that ended up as other human-like life forms. There are more branches than is necessary than if we just had ancestors. So we have sort of close relatives. Think about your father and your grandfather – they are your ancestors. But think about your father’s brother, and there are equivalents of your father’s brother or sister in the fossil record. To my mind they are just as interesting as the creatures that were directly or that we think are more directly ancestral to us. Now we branched off from chimps and bonobos but there’s quite a bit of genetic connection between us and the chimps. Now you have to realise that you share forty percent of your DNA with a banana. So there’s a whole lot of DNA that’s just there doing stuff, that doesn’t make you a human, or a chimp a chimp, or a monkey or a monkey. We’re talking about a small proportion of the DNA that makes us humans and makes chimps, chimps and bonobos, bonobos. The difference between us and chimps is in the order of one for two percent. But clearly that’s an important one or two percent because it means that you and I are sitting in a tram and I don’t see any chimps or bonobos running tramlines. It’s a small genetic difference, but it’s clearly pretty crucial. I don’t know maybe they should run the trams. They might get a little enamoured with ringing the bell though. I know I would and that would really annoy the passengers, wouldn’t it? Now, you’ve got a favourite fossil I’m sure, so tell me about your favourite human-like species and your favourite fossil. Well the one I like is a really strange creature, and it’s called paranthropus, which means its besides man. When it was found, the guys that found it they thought this probably isn’t a human ancestor, it’s something weird. The creatures I’m interested in are the variety of the paranthropus that live in East Africa and they live from about 2.3 million years to about 1.3 millions years, so they lived about a million years. They were the most extraordinary creatures – they had flat faces, wide faces, huge jaws, very large chewing teeth. If you’re look at your little fingernail that’s about the size of your first molar in your jaw. If you look at the size of your thumbnail, that’s about the size of the molars of these guys. They had huge chewing teeth. We don’t know much about them from the neck downwards, but these guys are really interesting. If I had a time machine and I could go back – I would go back and look at these guys. I’d go back and look and see how they used, what parts of the landscape they used, did they prefer to walk through the woods or did they prefer the open spaces. I’d really like to go and look at these guys. You know we tend to think, oh well they became extinct, so they weren’t any good – they were perfectly good. They lived a million years, which is the average length of time of a mammal species in the fossil record. There’s nothing wrong with them. My job as an academic is to find and put flesh on the bones. For example, you can look at the white part of their teeth, and you can look at what we call the isotopes in the enamel, and the isotopes in the enamel will tell you, whether those guys were eating leaves or fruit or whether they were eating grass. Now that sort of helpful because it helps us locate them in the environment, that they were living in. We can also look at the scratches on the teeth to see whether the food they were eating was leaving scratches on the teeth and that can give you a bit of an idea. But the good news is that it does give you a bit of an idea. The bad news is that the scratches on your teeth – probably reflect what you were eating in the past two or three weeks. And so, what an individual was eating just a few weeks before they died, might not reflect what they were eating when they were well enough and fit. Dammit, I think if I’d died tomorrow – you’d be able to tell from my teeth scratches that I had some pizza last night but hopefully you’d realise that I did eats lots and lots of healthy food too. For a really long time, really I did. Now at this particular point in history when these human-like life forms were alive, there were also other human-like, life forms alive at the same time. So does that mean we came out of Africa a number of times? Or was there evolution going on in different places at the same time? 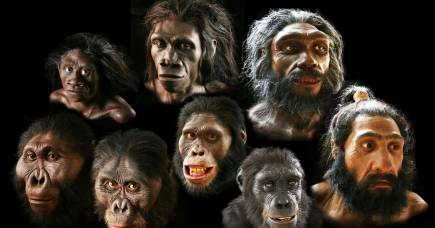 We try and make sense of them because only one of them can be our ancestor. But even so, we may have not yet found the fossils of our ancestor. They could all be our ancestor, yet they could all not be our ancestor. Because you know we can’t assume that everything that was important in our evolutionary history happened where we happen to find fossils. It’s the drunk looking for her keys under the lamppost problem. Just because you can see under the lamppost, it doesn’t mean that’s where you dropped your keys and if you’re drunk, it’s the only place you can’t see and so what’s the point of looking if you can’t see. So you know, that all sounds a bit trite but it’s really important because we mustn’t assume the places we find fossils are where all the action was. I’ll remember the next time I lose my keys and my mobile phone, and pretty much everything else. Thanks, Professor. We are more closely related to chimps and bonobos, and chimps and bonobos are only found in Africa. It’s pretty clear that humans evolved in Africa. The ancestor we share with chimps and bonobos was probably an African creature. When creatures that were either our ancestors or close relatives first left Africa is probably over two million years ago. And convention wisdom – which one should always distrust – there was a guy called CH Waddington who was a developmental biologist – well, he was an embryologist. He was pretty sceptical about his own work in many ways, which you should be as a scientist. He used to talk about the conventional wisdom of the dominant group, and his acronym was COWDUNG – conventional wisdom of the dominant group, which sort of you know reminds us that we shouldn’t be drinking our own Kool-Aid. In other words, just because we think this is a great idea, it doesn’t mean it is a great idea. The earliest of our close relatives and ancestors to leave Africa was probably a little more than two million years ago. It was probably a creature like homo-erectus. Which is found in south-east Asia, it’s found in Java. There is a dwarfed variety of it found in Flores and there is a report of an even older example of homo- floresiensis from a site that is a little east of the Liang Bua where homo-floresiensis comes from. That’s the hobbit. They now think the hobbit goes back about 700, 000 years, which is a long way. So in other words, homo-erectus was all the way over– and of course nearly to Australia. But as far as we know homo-erectus never made it to Australia. So that’s the first out of Africa. There was probably another one, probably in the last million years. From our point of view, you need to realise that all the people on every tram in Melbourne and all the people on every tram in Prague and all the people on every tram in San Francisco – all come from Africa. They left and they are descended from a population that left Africa, we think about sixty thousand years ago. So no matter who your worst enemy is or the supporter of the football team that you hate – you’re all African. Excellent. I’m saying exactly that to the opposition supporters sitting around me the next time things get heated at the football. I’m sure it will be all fine. Bernard, what would you like us to think about when we see fossils or effigies on skulls? I’ve got this scarf with these skull effigies on it. Those are all the real ones in the ground and the images are the ones on your scarf. They all represent animals that were alive in the past. Most of them, they’re not ancestral to animals alive today. In other words, we look around and see everything that’s alive today and we tend to think that’s the only way that live things can be. But if you go back in the tree of life, you realise that there are lots of creatures like the paranthropus that I’m interested in – that you would never predict from looking at the animals alive today. Even if you’re enormously impressed, which I’d hope you are by the wonder of life today – we should also be impressed by the wonder of life in the past. We know that sometimes what you look like can be misleading about how closely related you are. Because that can be misleading, you know as scientists we need to be our own worst sort of critics. I can relate to that; I am my own worst critic already. Now the always excitable Dr Andi, brings up a particular species of the paranthropus genie, called paranthropus boisei. It’s one of the professor’s favourites – he said so in a previous conversation with Dr Andi. Just quickly, it is the largest of the three paranthropus species and they lived in Eastern Africa in the Pleistocene epoch. From about 2.4 until about 1.4 million years ago. There you go. Now I know you’re impressed with that info. You mentioned paranthropus boisei as one of your favourite human-like life forms, now you mention they live for a million years. How long have homo-sapiens been alive? And will we live for a million years? Well, we reckon the molecular biologist will tell you that modern humans – in other words, homo-sapiens have probably been around for three or four hundred thousand years. There are fossils which look like modern humans, which are about a couple of hundred thousand years old. Let’s split the difference and say that we’ve been around for three hundred thousand years. Now if you compare that to the average mammal, we’re still 700, 000 years’ shy of the length of time the average mammal stays in the tree of life. Now that’s still – we’ve got a long time to go. One of the reasons that we are the only human great ape left on the planet is that we’re pretty smart. We have for one reason or another, we have survived, whereas our close relatives haven’t. We tend to think that makes us really super smart but the difficulty is that evolution works on a very long time-scale. Modern humans make decisions on a very short time-scale. So if you are to try and work out how we’re going to survive for another 700, 000 years, that’s not making the same decision that you would make if you want your party to be elected to the next parliament. We somehow have to get this smartness of modern humans back into a much longer, deeper time-scale. Otherwise, we’re not making sensible decisions on a long-term scale. And the other thing that we’re doing which really doesn’t bode well for our own survival, is that we’re busy driving to extinction the animals that we know that we’re most closely related to. So there’s no confidence I think from the people who work, who look at chimpanzees and bonobos and gorillas and orangutans, that is especially chimpanzees and orangutans have any future in the wild. Now that’s a pretty grim report card, that we are using the planet that we share with these close relatives, in a way that is effectively depriving them of a place on it. So I have to say, I’m not that optimistic that we are smart enough in the long term sense to be absolutely sure that we’re going to make the next 700, 000 years. Well, there it is - you heard the Professor says to look after the Earth because it’s not just our home but the home of our extended family, distant, as well as immediate. We all have to live here, so treat it with the respect it needs and deserves. Hopefully, after 700, 000 years – the new tenants won’t be complaining about how much we’ve trashed the joint. Thank you to our reporter Dr Andi Horvath and thanks to our wonderful guest Professor Bernard Wood from George Washington University. Head on over to our big sister podcast, Up Close, where you can hear more of Professor Bernard Wood. Like this. It would benefit us all to have a healthier dose of humility and the more you know about where you come from the more you know about the fact that we nearly didn’t make it - 60, 000 years ago and more about the fact that we share such a lot with chimpanzees and bonobos and gorillas and orangutans, and we are really busy trying to drive them to extinction. There are lots of reasons why having a much better understanding about of our place in nature, should make us better people. Eavesdrop on Experts, stories of inspiration and insights, is a production of the University of Melbourne, Australia. This episode was recorded in 2016. You can find a full transcript on our website. Recording and coproduction by Dr Andi Horvath. Production assistants by Claudia Hooper and Cecilia Robinson. I'm Chris Hatzis. Join me again next time for another Eavesdrop on Experts. In the evolutionary timeline of mammals, homo sapiens have not been around very long. Paleoanthropologist and Miegunyah Fellow at the University of Melbourne Professor Bernard Wood questions how much longer we have, given the environmental decimation humans are causing.